Instructions For Use: 1. If the surface is extremely dirty, apply Novus #1 liberally and wipe using long, sweeping strokes. Do not use pressure at this time or large dirt particles may scratch the plastic. 2. Re-apply Novus #1 Polish using short, circular strokes with a clean portion of the cloth. 3. When surface is thoroughly clean and uniformly covered, buff to a slippery glaze with a clean portion of the cloth. Surfaces buffed to a high glaze are more resistant to dust and future scratching. 4. 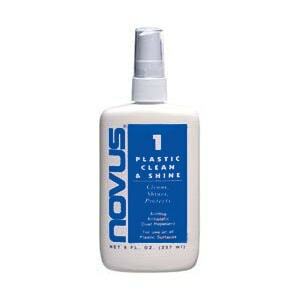 Re-apply Novus #1 regularly to maintain the anti-static, smudge and scratch resistant properties. Tell the world how great we are. SUPERIOR PRECISION, OPTICAL GRADE QUALITY, EXPERT PACKAGING, & FAST SHIPPING. WE BRING 20 YEARS EXPERIENCE MANUFACTURING OPTICAL MIRRORS IN TOLEDO, OH.